Thumb lines, the meaning: Every so often hand analysts take into consideration the meanings of the lines on the thumb. I have included the thumb lines here because it is something that interests me and I watched these lines on my thumb change over the past twenty-one years. The crease at the base of the thumb is a family ring. 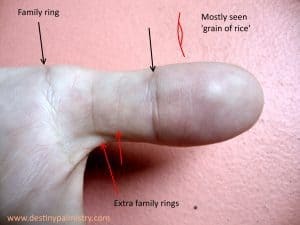 The line in the middle of the thumb is meant to show much the person cares about their family or how much involvement the person has in their family. A neat island in the middle is a good connection to family. It apparently depends on the depth and strength of the line. Sometimes disconnection from the family shows by a missing island on the thumb. The crease in the middle of the thumb lines (top phalange) is also about the health of the individual. It usually has an island formation, much the size of a grain of rice. If present in the perfect form, it is said to show a healthy person, a happy and robust family life. If broken, split or missing, the family life might be going through change or may have had disruptions. A family ring, intact like a chain shows close family ties. A second line above the family ring at the base of the thumb shows a marriage. It can depict that there is another family through marriage (or adoption or second marriage) or that there are two homes. More than one line here can suggest two marriages. Triangles on the line at the base crease of the thumb show inheritance. If the top line is (clearly visible and stands out) and contains an island, it shows much care for the household. If a line interferes with this line, it shows family rifts or issues. Crossed lines on the tip of the thumb show a frustrated or unhappy person. Horizontal lines on the thumb tip if not due to dry skin, point to nervous tension, overdoing things or poor health. A vertical line or two on the top phalange is positive energy for willpower. A vertical line or two on the lower phalange is a sound power of reasoning. It adds to the ability of analysis and logic. One card psychic tarot reading, click here to pick your card and get an instant reading.